London - Maurizio Sarri hailed Callum Hudson-Odoi and Ruben Loftus-Cheek as the future of Chelsea after the young guns inspired a crucial 3-0 win over Brighton on Wednesday. Sarri couldn't afford a negative result against struggling Brighton at Stamford Bridge after being subjected to fresh calls for his sacking during Sunday's unconvincing win at Cardiff. The angry Chelsea fans who showed their displeasure at the weekend were in part motivated by Sarri's refusal to select England winger Hudson-Odoi. But Sarri finally unleashed Hudson-Odoi for his first Premier League start, while Loftus-Cheek also made the most of a rare appearance as the youngsters bolstered Chelsea's bid for a top-four finish. Hudson-Odoi set up Olivier Giroud's first-half opener and Loftus-Cheek provided the assist for Eden Hazard's superb second. "The youngsters played very well, but I was already sure about it. Callum now is ready to play in every match tactically," Sarri said. "He improved a lot during the season. I'm really very happy with him because he also defended well. "He is happy but I told him he missed an easy chance in the first half! He has to stay with his feet on the ground." Achieving that target is essential for Sarri as he battles to avoid the sack so he can benefit from his youngsters' progress in the near future. "Loftus-Cheek for the first time this season is without a problem with his back. He scored a wonderful goal and played well," Sarri added. "I hope they can be the future of the club. They can become top players. Callum can be one of the best in Europe." Hudson-Odoi, has been directly involved in nine goals in his nine starts in all competitions, said: "The manager told me to go and express myself. I feel comfortable, hopefully I did well." Loftus-Cheek added: "We have both worked all of our lives for this chance, years of hard work and now we start in a Premier League game together. That's good for the academy." The 18-year-old's fine performances for England recently had shone the spotlight on Sarri's decision to use him so infrequently. Hudson-Odoi's name was loudly cheered when the team was read out before kick-off and he almost made the perfect start when his burst into the Brighton area ended with Shane Duffy deflecting his shot narrowly over. Adding a much-needed cutting edge to Chelsea's attack, Hudson-Odoi unfurled a pin-point cross that was headed over by Cesar Azpilicueta. Hazard's precise pass found Hudson-Odoi on the right flank and he effortlessly eased past Anthony Knockaert with a nimble piece of footwork before whipping over a low cross that Giroud cleverly flicked in from close range. 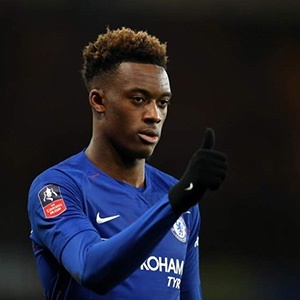 Hudson-Odoi was a far more potent presence than either Willian or Pedro have been on the flanks for Chelsea this season and he went close with a second half header. While Hudson-Odoi's potential is undeniable, Hazard remains Chelsea's main man, a point he stylishly underlined in the 60th minute. Inspired by that moment of magic, Loftus-Cheek produced a show-stopper of his own three minutes later when he curled a superb 25-yard strike into the top corner for his second goal in successive games.